Our special teams guru spends most of his days locked in the ITP film vault, sorting through kickoff returns, blocked punts, and outstanding coverage. During his playing days, he attempted (and converted) many an extra point from the traditional distance. Chuck Zodda digs into the whether the NFL moving the distance on the point-after-touchdown will have an impact on the league next season. On Tuesday, the NFL Competition Committee voted to move the line of scrimmage for extra points (XPs) to the 15-yard line, rather than the 2. The sound you just heard was a combination of specialists crying and fans bewildered that XPs now have the possibility of being missed. But what does this really mean for the NFL? Extra points have become nearly automatic in the modern era. As Benjamin Morris detailed in his excellent piece for FiveThirtyEight this January, NFL kickers missed a mere 28 XPs from 2011 to 2014. 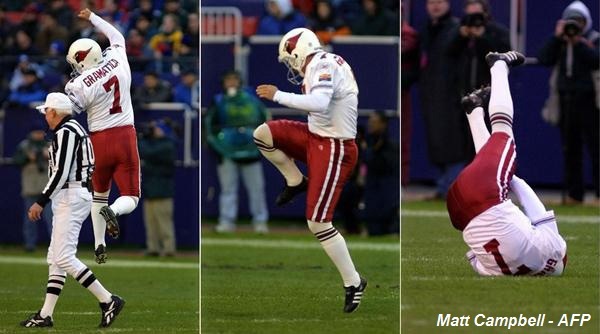 To put some context to that number, 4,939 such kicks were attempted, meaning that the average NFL kicker boasted a 99.5% accuracy on extra points during this time. However, the data from 2014 indicates that moving the line of scrimmage for extra points back to the 15-yard line is likely to have a meaningful effect on scoring. Last season, NFL kickers attempted 179 kicks from 30-35 yards, connecting on 166 of them for a 92.7% rate. If this rate holds true over a larger sample size, such as the 1,187 XPs attempted last season, there would be approximately 87 misses on extra points over the course of a season. Thus, what had once been a source of shame for kickers will now become slightly less embarrassing, but likely result in shifts in coaching strategy, and roster composition. In terms of in-game tactics, coaches will now have to plan for the fact that a touchdown is no longer seven guaranteed points. While the expected value of a touchdown with a traditional XP is still approximately 6.92 points compared to 7.01 points utilizing a two-point conversion, this changes the calculus even more for teams with weaker specialists. Two-point conversions will become significantly more important, as teams finding themselves missing an XP early in a game will need reliable options from the 2-yard line to even the score. Elite teams will take advantage of this early on, and likely will devote significant time during camp practices to this phase of the game, as it could be the difference between playing football or golf in January 2016. Teams will also feel the effect of this change in managing their rosters. NFL kickers typically are among the lowest-paid players in the league and, except in rare cases, have very little guaranteed money on their contracts. With this shift, elite kickers are likely to see their value rise, and this could mean added cash flowing to kickers in free agency, plus a future increase in franchise tag value because of this movement. However, this is not likely to affect guaranteed money, as kickers have tremendous variance from season to season, and as such, need to be fungible in the event they develop a case of the yips, as in the case of nearly every Detroit Lions kicker in 2014. Unlike cornerbacks or wide receivers, most teams will not carry multiple kickers, so cutting a kicker for minimal cost is important. Thus, while overall salaries may rise for top kickers, guaranteed money is likely to remain low. In short, this move should produce games that have added drama for fans without compromising the integrity of the game. Given the annual circus that the Competition Committee changes have become, this is likely to be a welcome change for the NFL, and something that should help to produce a better product in the years to come.